In the first season of Hot Ones, host Sean Evans proved that there's no wing he can't handle. But the world of spicy foods doesn't end at Mad Dog 357 hot sauce. 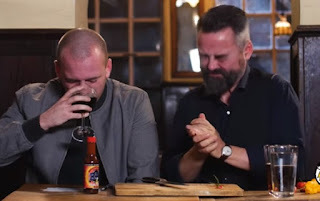 To train for Season 2 and ensure his invisibility on the Hot Ones stage, Sean met up with a true legend of the chili world—Denmark's ghost-pepper-popping Chili Klaus—to take on the hottest chili pepper known to man, the Carolina Reaper. Special thanks to "Smokin' Ed" Currie of PuckerButt Pepper Company in South Carolina for providing the heat.